Nirvana kind of ruined the plaid shirt for me. For a while, I couldn’t see one without thinking of grunge bands and 90s music. I didn’t do grunge back in the day (although I did listen to it) and I don’t do it now. I was so anti-plaid-shirt back in my college days that, when my sorority had a Woodser date party, I was the only girl not sporting a plaid button-down and jeans. Instead, I splurged on a gingham corset-and-shorts outfit that made me look like a cross between Daisy Duke and Ellie Mae. Not my best moment. Fortunately, it’s all grown up (and so am I), as these adorable looks show. Plaid with pearls. Why not? And sequins and velvet pants and fluffy skirts and all the cable sweaters your heart desires. It’s so versatile! Check out these adorable outfit pics for proof. 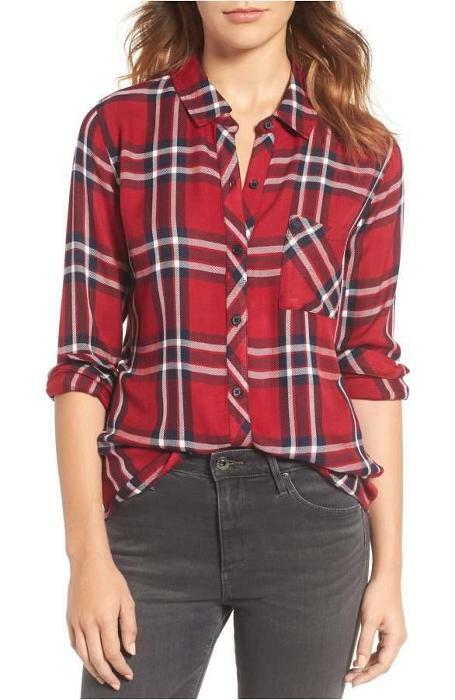 Classic plaids in classic colors are the most versatile. Look for a seasonless fabric and relaxed fit for this essential layering piece. I hope these ideas have inspired you to style your plaid in fresh, feminine ways!